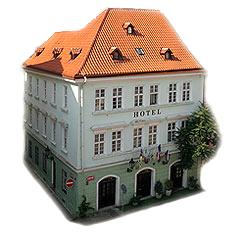 Betlem Club Hotel is located in the center of Prague, close to Wenceslas Square. Nearby are the Old Town Square, the Charles Bridge, Hradčany, Prague Castle, the Jewish Quarter, the Royal Route, Bethlehem Chapel and many other landmarks of the Old Town. Wenceslas Square (Czech. Václavské náměstí), informally known as "Vaclavak", is a major cultural and business center of Prague. It is approximately 700 meters long and has a boulevard 60 meters wide in New Town Prague that leads from the National Museum and the equestrian statue of Saint Wenceslas to the Mustek and the border of Old Town Prague. Wenceslas Square is surrounded on both sides with premier shops, luxurious offices, restaurants and hotels and has been a traditional place for organizing demonstrations, mass celebrations and a popular meeting place. Wenceslas Square is frequented by tourists, and if you are visiting Prague for shopping or entertainment, it is definitely one of the places for you. Wenceslas Square was originally founded under the name Horse Market during the creation of New Town by Charles IV in 1348. Up to the time of the National Revival, in 1848, when it was renamed Saint Wenceslas Square, it has become an important part of modern Czech history. After the First World War, 28 October 1918 there was a declaration of independence from Czechoslovakia. On Wenceslas Square there is a memorial to student Jan Palach, who set himself on fire in protest of the Warsaw Pact troops and their occupation of Czechoslovakia. Over the years there have been many protests and demonstrations, and in November 1989, finally culminating in the mass demonstrations of the Velvet Revolution and that led to the overthrow of the communist regime. The National Museum dominates the upper part of Wenceslas Square. With beautiful Renaissance buildings, the museum also boasts an extensive historical collection with a variety of exhibits. It is the most important museum in the Czech Republic and definitely worth a visit. The equestrian statue of St. Wenceslas on Wenceslas Square in Prague is the most famous sculptural monument in Prague. The author is the most important Czech sculptor of the 19th and 20 century, Josef Václav Myslbek, who worked on it for more than 30 years. 7.2 m high it has become a symbol of Czech statehood and a popular place for meetings "under the horse" or "under the tail" for all the citizens of Prague.